They're Here To Save The World. Prepare to spend some quality "slime-time" with Ghostbusters and Ghostbusters 2, together for the first time in this exclusive DVD gift set! These spooktacularly successful films captured the imagination of audiences around the world--and redefined the action-comedy genre in the process. This gift set includes the two films, each with an assortment of otherworldly extras, and a deluxe Collector's Scrapbook, loaded with production notes, character sketches, insider info and more. Because when it comes to supernaturally classic comedy, Who you gonna call? When kooky, spooky college profs Peter Venkman (Bill Murray), Ray Stantz (Dan Aykroyd), and Egon Spengler (Harold Ramis) lose their university jobs, they decide to go freelance, de-haunting houses in a new ghost removal service. As soon as they open their doors, their first order of business becomes saving beautiful cellist Dana Barrett (Sigourney Weaver) and nerdy Louis Tully (Rick Moranis), who've inadvertently opened the gates of hell ... right in their own apartment building! The Paratroopers of the Paranormal swing back into hilarious action in Ghostbusters 2 when an underground river of ghoulish goo threatens to rot the Big Apple to the core. Saving the world has never been this outrageously funny! $13.612 million on 1339 screens. Available Only as Part of Available Only as Part of the Ghostbusters Double Feature Gift Set. "And it don't look good..."
Well, I suppose that would depend on the nature of the oddity. I mean, if it's some apparently disreputable people, I'd phone the police, but if we're talking about an unusual growth or mole, I guess I'd contact my doctor. UFOs? I guess it'd end up in the hands of the military or some such. Really, you need to be more specific! What?? Oh. Um... Actually... Ghostbusters? Ghostbusters has been one of my favorite films for quite some time, and it was one of the first movies that I grew to love through video viewings. I saw it during its theatrical run in 1984 and thought it was okay but nothing special. That opinion changed radically as I watched it over and over on videotape. It's been so long now that I can't really remember what changed my opinion, but the fact remains that Ghostbusters is a charming and funny movie and one that has aged very well over the last 20 years. The lion's share of the credit for the success of Ghostbusters comes from the unstoppable presence of Bill Murray as Peter Venkman. He was on the top of the world at that point in his career, and Ghostbusters demonstrates that nicely. While the rest of the terrific cast offer fine work, this is Murray's movie and it lives and dies with him. That's why it continues to work so well. Ghostbusters isn't my favorite Murray movie - the horribly underappreciated Quick Change takes that honor - but it offers probably his best performance. Murray's very good in that film, but I love it mostly because of the contributions of supporting players such as Tony Shalhoub and Kurtwood Smith. As such, Murray needed to provide a strong performance for that film to work, but he didn't have to carry the whole show. The situation isn't quite that extreme with Ghostbusters - such a terrific supporting cast makes that impossible - but I nonetheless feel that it wouldn't be nearly as fun and entertaining as it is without Murray's amazing performance. I think he's part of the reason why I enjoyed the movie so much on videotape, even though the fullscreen transfer is a badly botched pan and scan job: Murray's so magnetic that the presence of the other actors frequently seems irrelevant. Not to slam the rest of the cast, of course, because they all do very well in their parts; there's not a weak link in the chain. Probably the best supporting work comes from Sigourney Weaver as Dana Barrett, the Ghostbusters' first client and Venkman's prospective girlfriend and Rick Moranis as Louis Tully, nerdy accountant turned into supernatural figure. Weaver gives Barrett a strongly grounded sense that seems crucial to the success of the movie as well. She's never been more charming, engaging and natural than she is here. Moranis has been a favorite of mine since back in the days of SCTV and he does the exact opposite of Weaver: his performance is a blatant caricature and tremendously over the top. But you know what? It works. Louis isn't as important to the plot, but Moranis offers a fun kind of goofiness that makes his work endearing. Louis is clearly something of a loser, but he's a very lovable loser as Moranis gives him a sweet quality that keeps him from becoming just a stupid stereotype. Ultimately, Ghostbusters isn't the most clever or best plotted or best constructed film in the world, although it does pretty well for itself on all those accounts. 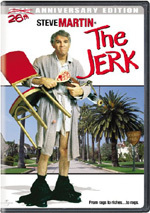 It's simply very amusing and a lot of fun, a movie that includes very few dull spots despite the large cast and the tremendous amount of exposition involved. I'm clearly biased, since this movie's been a personal favorite for so long, but I think Ghostbusters is one of the best comedies ever filmed. 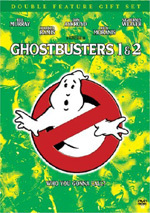 Ghostbusters appears in an aspect ratio of approximately 2.35:1 on this single-sided, double-layered DVD; the image has been enhanced for 16X9 televisions. I’ve never seen a video version of Ghostbusters that looked consistently good, and this transfer didn’t alter that impression. I often noticed problems with sharpness. Close-ups out to three-shots were fine, but anything broader than that tended to turn moderately mushy and soft. Since the cinematography often used wider shots, this meant a fair amount of less than accurately defined images. I noticed no issues with jagged edges or shimmering, though, and edge enhancement was minimal. Source flaws also created distractions. Grain occasionally became prominent, and a mix of specks and bits of grit popped up sporadically throughout the film. Although they never dominated the image, they marred the presentation with some frequency. Before I watched this new transfer of Ghostbusters, I’d heard some remarks that indicated it altered the film’s palette. Always a drab-looking flick, I feared the 2005 image would amp up colors to violate the original production design. While the tones indeed looked a bit brighter than in the past, I still think the movie’s visual scope remains intact. Various hues came across as more natural and full now, but they didn’t dominate the presentation. The flick remained fairly gray, and all the characters continued to appear as though they’d not seen the sun in a while. I felt satisfied with the colors of this transfer and felt they stayed acceptably true to past incarnations. Blacks were also quite good, and low-light shots seemed decent. At times the shadows became a bit murky and impenetrable, but these instances didn’t dominate. Instead, those shots were reasonably clear. The new Ghostbusters transfer had good moments, but the softness and source defects dragged my grade down to a “C+”. The Dolby Digital 5.1 soundtrack of Ghostbusters also came with a mix of highs and lows that meant it ended up with a “C+”. The biggest problems related to the use of the subwoofer. When this track got its remix, someone must’ve decided to go nuts on the LFE channel, as it too heavily dominated the audio. This caused two main problems. First, the score often became overwhelmed with bass. Elmer Bernstein’s music emphasized the low-end to such a degree that the other elements usually got lost in the shuffle. Bass seemed too strong for effects as well, but they handled things better; the score sacrificed its subtlety due to the low-end problems. In addition, I noticed a pronounced rumble in my subwoofer during various parts of the movie. I usually heard this in quieter moments; it may have been there in the louder scenes as well, but I expect the other aspects of the mix drowned out that element. This rumble certainly didn’t seem to be part of the intended soundtrack; it came across as an artifact of the overemphasized bass, It wasn’t a loud noise, but it purred at me in such a way to distract me from the movie. These subwoofer problems were a particular disappointment since the rest of the soundtrack worked so well. Ghostbusters didn’t use a tremendously broad soundfield, but it definitely opened things up more than usual for a flick of its era. Music showed nice stereo dimensionality, while effects spread smoothly across the front. As one might expect, the various ghost-related scenes offered the best opportunities for movement and activity, so the soundtrack provided the most action in its second half. The surrounds added good life during those spook segments. They kicked in good reinforcement of the spirits and Ghostbuster attacks, so they became reasonably active partners in the action. Before the original 1999 DVD, I’d had poor experiences with the audio quality of Ghostbusters. Earlier laserdiscs and videotapes sounded rough and distorted. The 1999 DVD cleaned up matters considerably, and that trend continued with this new version. Speech still occasionally betrayed a smidgen of edginess, but the severe brittleness I’d heard in the past was gone. Instead, the lines usually appeared natural and concise. Once I got past the excessive bass, the music was lively and clear. Perversely, the movie’s pop/rock tunes sounded better than Bernstein’s score, as they didn’t emphasize low-end nearly as much. That’s odd since I’d expect them to use bass more actively, but that’s the way it worked. As I noted, effects also were a little low-end happy, but they didn’t boom and rattle too badly. Instead, they showed pretty solid clarity and accuracy, and their use of bass often helped them accentuate the scenes. The overuse of the LFE really harmed this track and knocked my grade down to a “C+”. With better bass management, this audio would have definitely made it to “B” or “B+” levels. I alluded to the original 1999 release of Ghostbusters earlier. How did this 2005 edition compare in regard to picture and audio? As far as I could tell, both DVDs offered identical 5.1 soundtracks; I noticed no differences between the two. On the other hand, I did think we got two different picture transfers, even though I gave both the same “C+” grade. Each has its own strengths and weaknesses; it just happens that they both end up with a “C+”. The 1999 transfer had weaker colors and was a little dirtier, but it offered generally superior definition. The 2005 image’s vague softness was as evident, though the 1999 version showed some edge enhancement that marred a few shots. The 2005 edition would have been the winner without the softness. In addition, it turns the climactic scene abnormally bright. The shots with Gozer are much whiter than in the past, and this choice doesn’t make much sense. It’s a small change but a noticeable one. Ultimately, you can go with either transfer and end up with similar results; whichever one you choose will likely come down to a personal preference. For its second DVD release, this version of Ghostbusters mostly duplicated the extras from the prior version. I’ll detail differences after I finish with its extras. We begin with the same audio commentary found on the old disc. It includes a running, screen-specific chat with director Ivan Reitman, co-writer/actor Harold Ramis and associate producer Joe Medjuck. They discuss the project’s origins and the development of the script, improvisation and characters, casting, visual effects, sets and locations, and general anecdotes. At its best, this track offers a nice take on the film, and I certainly can’t fault the scope of the material. However, too much of the time, we simply hear quotes of movie lines, praise for the flick, and laughing at the gags. Occasional dead air also mars the proceedings. There’s definitely enough good information on display to make this a useful commentary, but the flaws mean that it doesn’t ever become a great one. The DVD includes three separate video pieces. As implied by the title, the 1984 Featurette was produced at the time of the movie’s theatrical release and runs nine minutes, 24 seconds. It's essentially a puff piece but it's a lot of fun. Due to lots of good footage from the set, it offers more depth than the usual promotional featurette, and the brief interview clips with the principals are very entertaining. We hear from Reitman, production designer John De Cuir, visual effects supervisor Richard Edlund, and actors Sigourney Weaver, Bill Murray, Dan Aykroyd, and Rick Moranis. Murray proves especially amusing as he tosses out his usual wisecracks. We don’t learn tons about the movie, but we enjoy the ride anyway. We also get a modern Cast and Crew Featurette goes for 10 minutes, 51 seconds. This one only includes interviews with Ramis, Reitman, and Aykroyd. We hear about the project’s origins and the recruitment of the team members, story issues, their kids’ reactions to the movie, impressions from the set, and the flick’s impact on their careers. It's got a few decent moments but it’s not as much fun as the older one. Murray, Weaver, and Moranis are sorely missed, and it lacks all the interesting behind the scenes shots. I also would have liked more about making the flick and less of Aykroyd’s unconventional ideas about the supernatural. Finally, a third SFX Team Featurette provides new interviews with much of the special effects crew; it lasts 15 minutes and 21 seconds and includes remarks from Edlund, visual effects art director John Bruno, animation supervisor Terry Windell, technical animator Annick Therrien, visual effects editor Conrad Buff, chief matte artist Matthew Yuricich, model shop supervisor Mark Stetson, chief visual effects cameraman Bill Neil, matte department supervisor Neil Krepela, mechanical effects supervisor Thaine Morris, visual effects still photographer Virgil Mirano, and matte artist Michelle Moen. We learn how the team came together, various challenges – including the budget – and how they accomplished the flick’s main effects and visual elements. It’s refreshingly entertaining, partly because of the "old school" methods that were used – I can't watch "Slimer" fly around the chandelier without laughing now that I know how they did it - but also because the participants don't just focus on the technical work; they also provide insight into the other aspects of the production. Although I wish it were longer, it's a very fine featurette. What else? There's a section called SFX: Before and After that lets you work out that underused "angle" button on your remote. It offers three scenes from the film, and if you use the "angle" button, you can switch between the way they looked in the finished film and they way they appeared in the rough cut before the special effects were added. I didn't think much of this feature; it just seemed like a token way to use the "angle" gimmick. Located in the “Special Effects” area, a collection of Production Photos breaks down into seven subsections. We get “Ghoulish Librarian” (24 stills), “Lovely Floating Ghost” (18), “Production Team” (4), “Slimer” (59), “Spook Central” (44), “Stay Puft Man” (65) and “Terror Dogs” (75). Also under the “Special Effects” banner, we find nine sets of Conceptual Drawings. These cover “Colorful Early NYC Concepts” (10), “Colorful Ecto-Mobile Interior” (3), “Early Stay Puft Man Concepts” (3), “Light Stream Chalk Drawings” (19), “Pencil and Chalk Creature Concepts” (157), “Pencil Librarian Ghoul Concepts” (4), “Pencil Terror Dogs Concepts” (4), “SFX Conceptual Paintings” (9), and “Early Logo Concepts” (16). These areas provide plenty of interesting and informative drawings, but style triumphs over substance. Both sets of images are way too small; they are "windowboxed" so that very large expanses of the screen are unused for these pictures. Was there any reason not to make them fullscreen? Not that I can detect, other than to make the thing look more stylish. The “Conceptual Drawings” also suffer because they're displayed at a slanted angle; they're supposed to look like they're sitting on an artist's workboard. Too small and at a funky angle: that's not how I prefer to look at materials. We also get a bunch of storyboards, which are provided in a couple different ways. Split-screen comparisons are offered for three different scenes; the storyboards appear on the top of the picture while the actual film images appear on the bottom. We get these for “Slimer” (one minute, 52 seconds), “Dogs Drag Dana” (1:49) and “Atop Spook Central” (1:44). These are okay, but I find them somewhat uninteresting. A little better is the "Ghostly Gallery" which includes storyboards for twelve different scenes; some of these segments appear in the final movie, some don't. To be frank, I care little about the boards that ended up in the movie; it's the unused scenes that interest me, so I liked this part of the DVD pretty well. Speaking of unused material, Ghostbusters features ten deleted sequences in the Scene Cemetery. The shortest segment is 16 seconds long, whereas the lengthiest goes for 82 seconds; in total, we get about seven and a half minutes of footage. None of these are fantastic - you can see why they weren't used - but they all are fun. 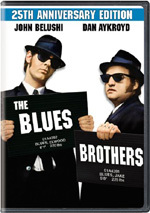 The best of the bunch provides a bit that features Murray and Aykroyd in different roles. What does the 2005 DVD lose from the 1999 release? 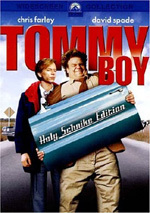 While both offer the same audio commentary, the 1999 version added a video element. This showed the participants in silhouette as they watched the film. It wasn’t useful or interesting. In a negative move, the 2005 DVD drops a very good “Tricks and Trivia” subtitle commentary. Finally, the 2005 release eliminates trailers for Ghostbusters and a few other movies along with a booklet. However, the 2005 release includes a new booklet that’s superior to the old one. Called the “Movie Scrapbook”, this 28-page tome features production notes, information from those involved with the flick, a few biographies, photos, storyboards and sketches. It adds good value to the package. After more than 20 years, Ghostbusters remains a comedy classic. I’ve seen this movie at least 30 times over those 20-plus years; indeed, I watched it twice in three days to complete this review. And you know what? It still makes me laugh. The DVD offers acceptable but flawed picture and sound with a good roster of extras. Despite some concerns about the disc’s quality, this is a good package, so I definitely recommend it. Or I should say that I recommend it to anyone who doesn’t already own the 1999 DVD. If you have that one, should you “upgrade” to the 2005 version? Probably not. The 2005 disc loses a few extras from the original release and adds little new. It provides apparently identical audio with a fresh transfer that alters but doesn’t seem to improve on the old one. Since the Ghostbusters release pairs the first flick with Ghostbusters II at a nice price, it’s an appealing package if you want the sequel. However, if you’re just looking for an improved Ghostbusters, this isn’t it.